← Ahead in 2012: Intention & value systems in our culture. And a book. Chris, I just started reading your deep-dive text – and I am excited. I will cancel a meeting this noon (which is in two hours :) ) to take some time and read through it. You obviously did some impressive research (on one of my favourite philosophers) – and aimed at quite a daring translation/expansion. So great to hear, Carsten, my sincere thanks. Energy for the deep dive was fueled by the great feedback you and others provided on in our foundational “Divergence” stream. The time? Carved mostly out of sleeping hours! Can’t wait to hear back. 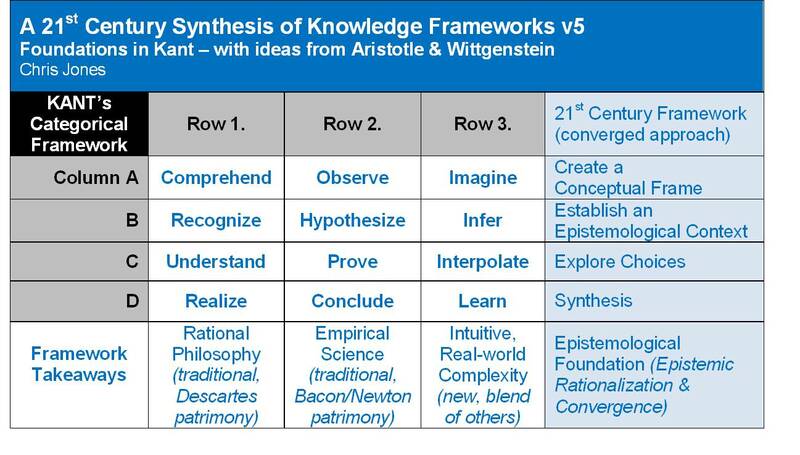 As some of your G+ commenters mentioned, the whole framework depends on the definition of knowledge. Can there be absolute knowledge in our imperfect, mortal experience? I propose that because the human intellect is fallible, absolute knowledge is rare at best. The verbs in the framework are only as reliable as the person performing those functions. Thus the framework is only useful as far as the one using it is correct – not only in the facts he already knows, but in the rational process of thought that leads him to further conclusions. If we frame this set of ideas in the context of belief rather than knowledge, the whole thing works better. Belief requires much less rigor to acquire than knowledge, and it can be changed when new information is available. Absolute knowledge cannot be changed or undone, because true knowledge must be based on absolute truth. Hi Nathan, thanks much for your response. I agree completely that everything in knowledge framing hinges on semantics. That’s why I introduced Wittgenstein to the mix. He is the clearest voice I know that all of philosophy hinges on how we define things. 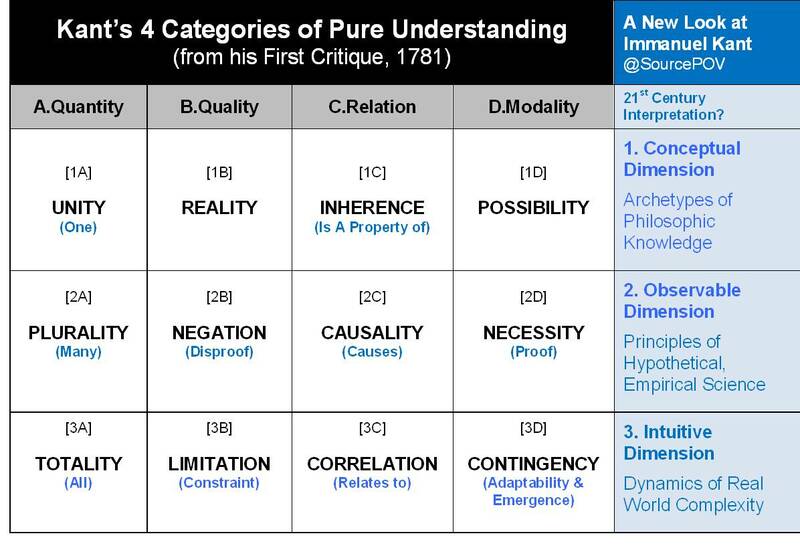 Kant’s not here to explain himself, but given his framework of categories that intends to describe any aspect of knowledge, I believe he’d want us to apply it in ways that made practical sense. I used my verbs as an example in the post, then later, on G+ (linked above) introduced a cinematography metaphor. I’ve been mulling some examples from mathematics too. The verbs helped me translate Kant into the modern vernacular, as I worked to distill insights from the rows (3) and columns (4). If a convergent epistemology linking science, philosophy and complexity holds up, I’ll be thrilled. I see echoes of Bacon/Newton as well as Descartes. In a sense, my verbs were declaring my semantic interpretation of his 12 categories, for discussion. By collaborating, we might improve on them; for now, they represent 12 stakes in the ground. I think the word ‘absolute’ is always dangerous, and I hope I didn’t misspeak there; certainly not my intention. Finally, yes, personal belief is safer, more down to earth, and more easily ascribed to the individual believer. But there’s much to be said for personal knowledge too, supporting customized, localized interpretations of what we come to know. But I need to brush up on my Polanyi before I dig myself any deeper! Appreciate the thoughts. Looking forward to more. Chris, I like how you’re approaching Kant’s twelve categories, and in particular, the distinction that you are making between a philosophical (introspective) and scientific (empirical) worldview. I don’t know if it hold here, but at the least, I think it is helpful to think about. Kant thought his table of categories was of central importance, but nobody else seems to have. Where did you find sources for what he actually meant by them? It seems hard to know. Your order is different than the one given in Wikipedia http://en.wikipedia.org/wiki/Category_(Kant) and I wonder why. I mean that you switch existence and necessity. Kant drew his categories from the form of logical judgements. Instead, I think of “topologies”, backdrops for the imagination. I generate them by “mind games”. For example: Search for “constancy”. Either you find “one” example, or “all” is constantly unconstant. And what you select and what you evaluate must be the same, so it is “multiply” constant. This defines “one”, “all”, “many”. I know of four such mind games and they are organized by Aristotle’s four causes. But the twelve topologies that result are slightly different then Kant’s. They include “object, process, subject” and “be, do, think”. Basically, there is much to think about here, but there’s a need to think through the table from first principles, as well as from a survey of what we encounter. I think your explorations are helpful in that regard. Thanks so much for the thoughtful response. If, in your estimation, extending Aristotle’s 4 causes produces similar but slightly different categories from Kant’s, then I am excited. My initial read of Kant is that he was onto some of the core foundations of knowledge, though some of the specifics may not have translated well from the German, and the apparent connections to both Aristotle and the structure of Western language (qualifier, noun, verb, predicate) were fascinating ..
Wittgenstein’s view of language and its ambiguities enters here .. slight variation in definitions .. greatly complicated by translations from German (Kant) and Greek (Aristotle) to English .. can clearly create opportunities for less precision. Conversely, if we use this argument to apply some semantic rigor now, I think we might derive further understanding and alignment across Aristotle v. Kant .. exposing similarities and differences in a clear way. Back to my post, my approach a simple thought exercise. I saw interesting patterns in the representations of the C.F. that I could observe by looking at it (including the wikipedia representation). I then created logical “21st century” semantic substitutions that would better approximate my own experience (clearly introducing room for error, but again, providing some critical thinking) to produce the analysis you see above. Any variation from other sources is my attempt to navigate semantic ambiguities, not to violate the integrity of Kant’s model. The best validation of my 3-tier frame for science, philosophy & complexity I’ve found was in Tarnas (1991), p.341-351. He doesn’t speak to complexity outright, but he does describe Kant’s C.F. as an attempt to categorize empirical science v. rational philosophy in a consistent way then identifying a third “hybrid” that applies both in the real world. That’s what jumped out at me from observation, and the Tarnas explanation seems to support my conclusion. That consistent way of course was the his over-arching a priori contextual framework that our minds use to make sense of everything in space and time .. which the C.F. columns further break down .. If I’m right in interpreting Kant, complexity will have its own epistemology and won’t be “complexity science” at all. 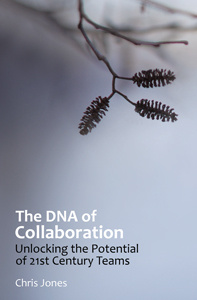 With discussions of patterns, attractors, outcomes, etc., I think it is already emerging. Complexity may be an early-stage paradigm shift (Kuhn, 1962). Sadly, I don’t know who is authoritative on Kant. Like you, I’d very much like to know .. so we could further vet our ideas, and improve on our interpretation .. maybe even build some consensus. Thanks much for the response. Let’s keep digging. Hey guys, back after a few months away. Sorry to go dark. Now that my book is out on Amazon (with mention of this stream in Chapter 20 re: Critical Thinking) I’m starting research on a second book .. an e-book on Kindle .. which will derive directly from what we’re discussing above ..
… or something like that. Let me know if you’d like to help me write it. I hope to build and expand on the core ideas here .. via posts and comments .. as we’ve been doing. Can do some of the heavier lifting on G+, but I’d like to keep a dialog here ..
To answer my own (not that rhetorical) question, I’ve done some digging, and I’m now reading “Basic Writings of Kant” by Dr. Allen W. Wood (2001) at Stanford. Just plowed through his Introduction, and quickly learned how Kant’s life and thinking evolved. I think I found some intriguing clues that might help validate my 3-tiered epistemology thinking, outlined in the original post. I’ve also found some great insights in Tarnas (1991). Let me know if you guys would like to reengage on this .. it’s been awhile, but I’m still primed and ready for a deeper dive. Excited about what could lie ahead ..
.. now reading: “Critique of Pure Reason, Preface” (1781). Philosopher Louis Pojman has suggested four strong influences on Kant’s ethics. The first suggested is the Lutheran sect Pietism , to which Kant’s parents subscribed. Pietism emphasised honesty and moral living over doctrinal belief , more concerned with feeling than rationality. Kant believed that rationality is required, but that it should be concerned about morality and good will. Second is the political philosopher Jean-Jacques Rousseau , whose work, The Social Contract , influenced his view on the fundamental worth of human beings. Pojman also cites contemporary ethical debates as influential to the development of Kant’s ethics. Kant favoured rationalism over empiricism , which meant he viewed morality as a form of knowledge, rather than something based on human desire. Natural law (the belief that the moral law is determined by nature) and intuitionism (the belief that humans have intuitive awareness of objective moral truths) were, according to Pojman, were also influential for Kant. Excellent feedback, Jana. I’m a major fan of Kant but only recently a student, so I am hungry to discover authoritative sources & more on his foundational influences. You have already helped me with several. As it happens, I’m reading Rousseu’s “Social Contract” as we speak, and just received a copy of Patrick Riley’s “Will & Political Legitimacy” who ties in not only Kant & Rousseau but Hobbes, Locke and Hegel as well ..
Social Contract is on my radar for future posts .. So your comment is extremely timely .. Thanks so much for bringing interest to an older thread. This is a conversation I’ve been planning to get back to .. and I hope you’ll continue to weigh in here ..